Terrible app to use. None responsive 90% of the time when asking it to sort by price. Searched for business class flights then when trying to combine this with hotel, it keeps reverting back to coach seating assignments making you think it’s a great deal!!! Awful!!! Downloaded this to use with iPhone and Apple Watch but astonishingly no way to connect to iCloud email account??!? (Google and Outlook are fine, but this is an Apple store item???!). Fine, I can forward emails, but why ultimatum functionality not included? Also, why is not possible to add a trip manually? We just changed flights to go earlier, this doesnt feature in the original email booking. Overall v disappointing. Fast search. Has been using this app for 5 years. 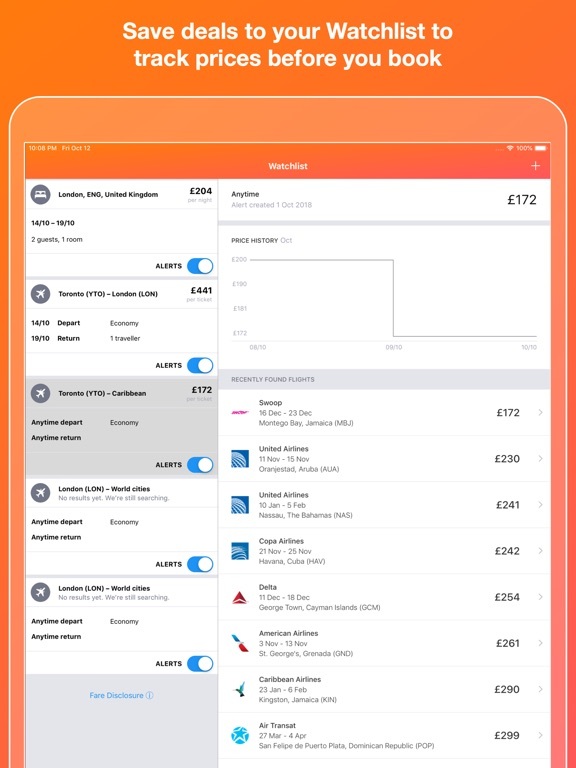 I used to love Kayak, both the app and the website, but I’ve found some of the recent changes when searching for flights to be confusing and I’m yet to like them. For example, I used to be able to pin a flight, and I used to be able to save a flight to a trip. Now I can bookmark a flight, but it goes to a trip it specifies, and not me. I felt it was fine that way it was and I’m afraid I can’t understand why some of the changes were done. 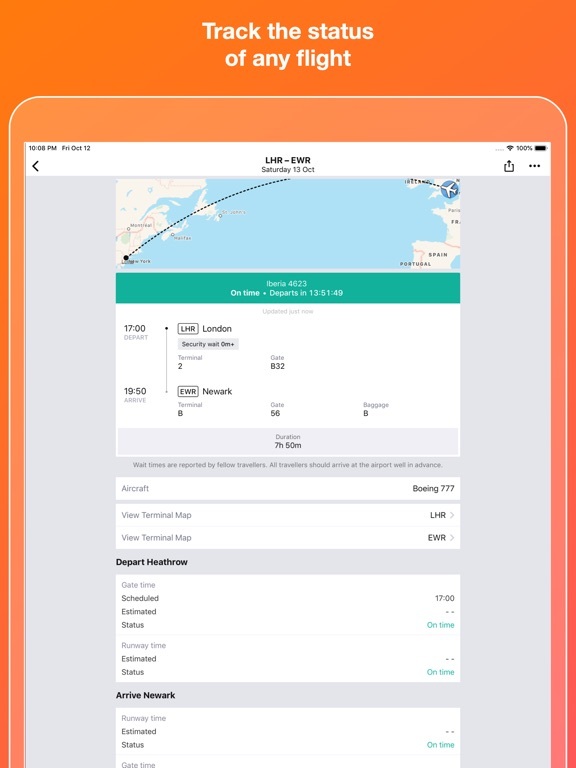 You can forward all of your travel emails to Kayak and it automatically creates a trip containing everything you require and it works offline. 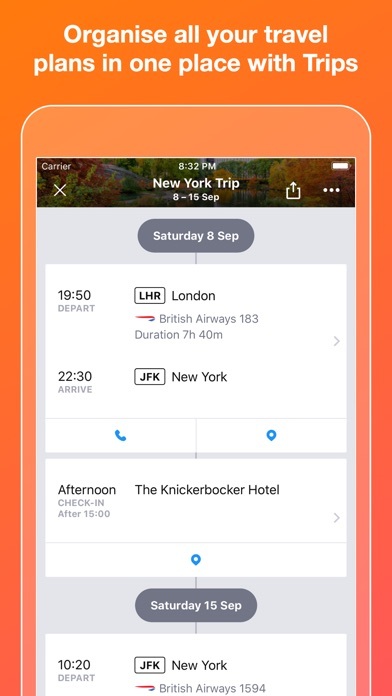 It also automatically sends to notifications on delays, gate numbers, takeoff and landing times. Excellent for managing your expense receipts. Love it!!!! So easy to use and navigate. Quoted price for a multi-trip from UK to Far East. When I clicked through did not include luggage. Did they think I was going away for 3 weeks and intending to just wear the same clothes? Great app but removed countdown to holiday? Awesome app, been using for years now, but recently they removed the countdown to holiday not only on widget but also online it seems. Please put this back so I don’t need yet another app to do a countdown too! Easy to use, superb information. I travel regular to Slovakia and it’s brilliant for guiding me on when to book. I’m planning a trip across Europe for my partner and myself and it involves 6 countries in 2 weeks, numerous train journeys and 3 flights! Kayak has fantastic at helping me puzzle everything together. 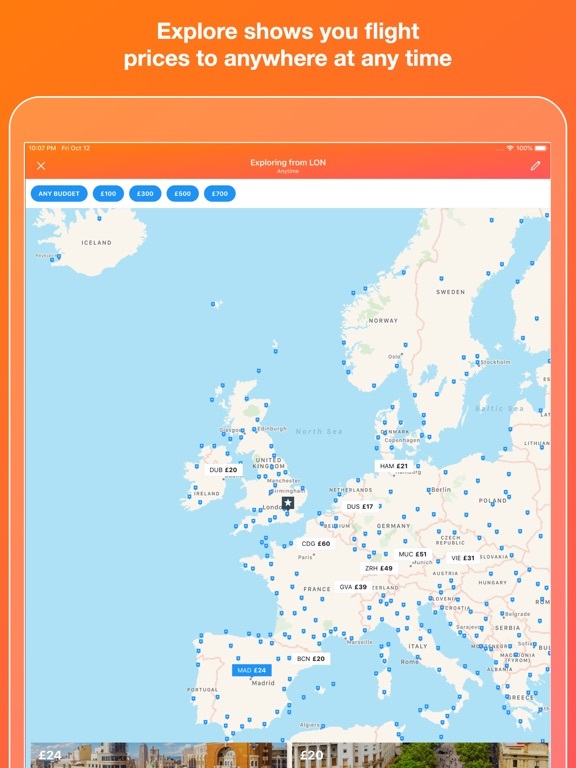 All of my flights, hotels, tours, airbnbs and trains have been saved in one central location and I will certainly be using this app every time I travel! Kayak always finds the best deals for flights. Easy to use site. Highly recommend! bugs prevent payment, double booking risk, lost booking? Used this app and website so many times for years without problems until 2018! Credit card authorisation now causes app error message, app cannot find the usual bank authorisation for Kayak payments. 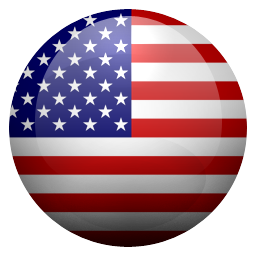 Then alternative payment through Viyama pops up, a few dollars more, no bank authorisation online, message to telephone USA, expensive international call, no reply on that number. No clarity if booked or not for a day or so. In fact Viyama did take the money last week and email the ticket but yesterday I attempted to book another flight but have no idea, is it booked or do I start over. meanwhile the flight has gone up $1003 more!!! It’s a really good app especially the notification of trip information. However, when booking under the “flight&hotel” tab I would like to be able to choose cabin class. Thanks for a great app! Have never got the price advertised, and my settings are for two adults one child, when I am diverted to other websites like Tripsta it has changed to 3 adults with no option to correct. In the back and forth war of the booking apps. Kayak is doing a great job. I also enjoy Hipmunk for slightly different reasons. Amazing results and much better than skyscanner that I used all the time. Thanks kayak. Everything works well but is doesn't allow me to save my search preferences like direct flights only as fist option. Wow. I absolutely love this app. Tried all the rest - wipes the floor with them. Tripit is the next best one, but just doesn't compare. The UI and little features in Kayak are beautifully thought through. Lots of little touches which shows it's really been designed with the user in mind. I've used Kayak for years. Love the trip watch function to be prompted when pricing changes. Also the alerts when flights are delayed or on time, alert to go to gate etc. It has got better and better. Best thing is being able to set 'watches' on flight prices. This has save me a lot of money in the past. I like the feature where you can add your travel but the flight comparison element is very poor. You find a flight, click on it and it is no longer available and the price shoots up. You research and it still comes up, if it's not available why re-list it? This has happened many times now. I'll keep using sky scanner as I find their prices are mostly accurate. No way to choose class i.e., economy or business? Why oh why do successful apps feel the need to change for the worse. This one freezes. Has become my go to resource for booking flights. Excellent UI and easy filters make it a joy to use. I have been a fab of kayak ling before app was created. So absolutely adore the app these days!! I like the app but want a card scanner inbuilt to avoid having to manually enter card which improves customer experience tremendously as well as time consumed to make booking. 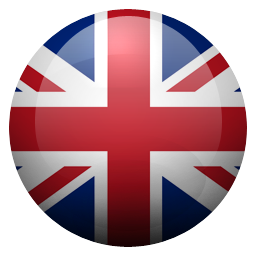 Need to do it in Great Britain currency on the app. 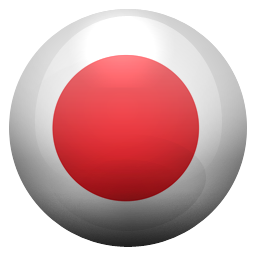 A great little app, which is easy to use. Not been properly tested. Now unusable. 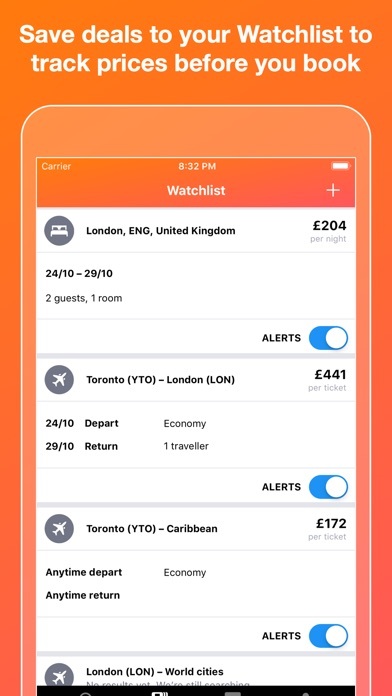 (Update: I changed the rating to 5 stars as the most recent update now has Instant Booking where available, this is definitely one giant step towards creating a more seamless and integrated experience) I love this app, I love how it fully integrates with Apple Watch, iMessage and Apple TV as well as Passbook and Apple Pay. I do however have one pretty huge gripe. 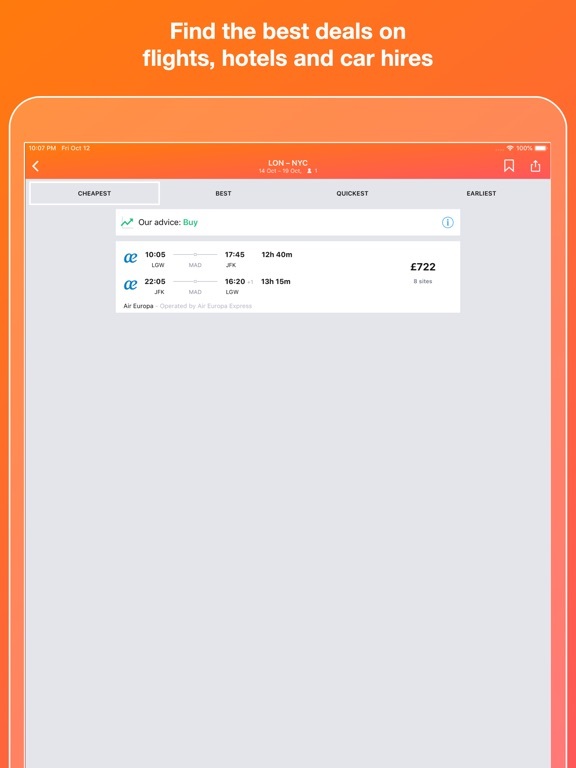 I have used a few Chinese apps of the same variety and what I absolutely love about them is how you can book a hotel, car, fight, train etc completely within the app. Kayak always transports you to the website view (yet still within the app, maybe they have to do it this way) but it helps create a really inconsistent style and experience. Switching from the very beautiful and simple Kayak view to the messy website view (which of course differs depending on which hotel, flight or car you book) is not very pleasing to the eye nor effective as on the majority of times the web view displays prices or flights that are different to what I just saw in the Kayak app view or it just takes me back a step to techies dates. 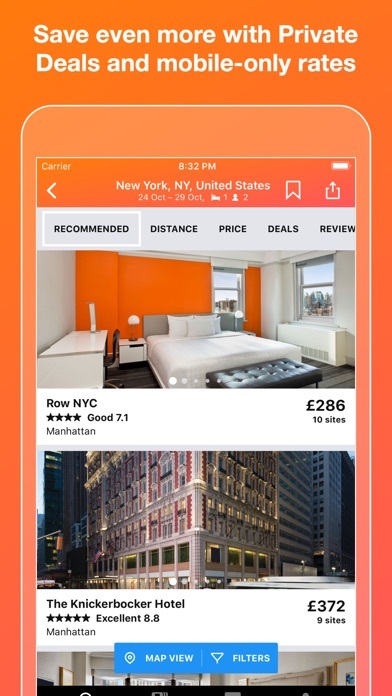 I would love to just book through the app and have a consistent style and structure as well as payment style. This feature definitely costs the app 2 stars for me. 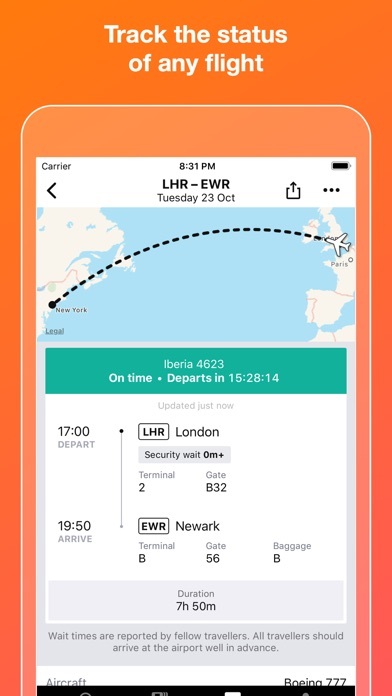 Ask yourself this: How useful is a travel app that doesn't let you change dates? Answer:Very. Gone from being one of the best to pointless now. I'm removing it. Sorry but the latest update now means the app crashes when I try to select flight dates. So now unusable. Prior to this, it was a very good app. This bug needs fixing ASAP. Selecting dates causes the app to freeze and crash; needs attention soon. Since the update I cannot enter travel dates for flights. Amazing app, but this is an fundamental feature for the app to work. Please fix. Recent upgrade has resulted in the app being useless. Cannot enter travel dates. Really like the new layout and the app is usually brilliant, but one major flaw, can't search for flights on the dates I want! Really like using the Kayak app but this last version is broken. Cannot select flight dates, then it hangs and crashes. So you find a hotel click through the then the price increase, talk about false advertising - buyer be wary! This latest update has broken the ability to select dates for travel. It's completely unusable now! The update has broken the ability to select dates when booking flights. This was my go to app but is useless now!! Great app, tried lots but always return to this. Thing is, its so slow to load all the flights (could be my phone but other sites load in half the time). Love the new UI, but why can I no longer specify the range (+/-1/2/3 days) for flexible departures? Always saves me £50-60 on USA flights compared to booking direct with the airline. The new app when you look for "earliest" it should be earliest arrival not departure. 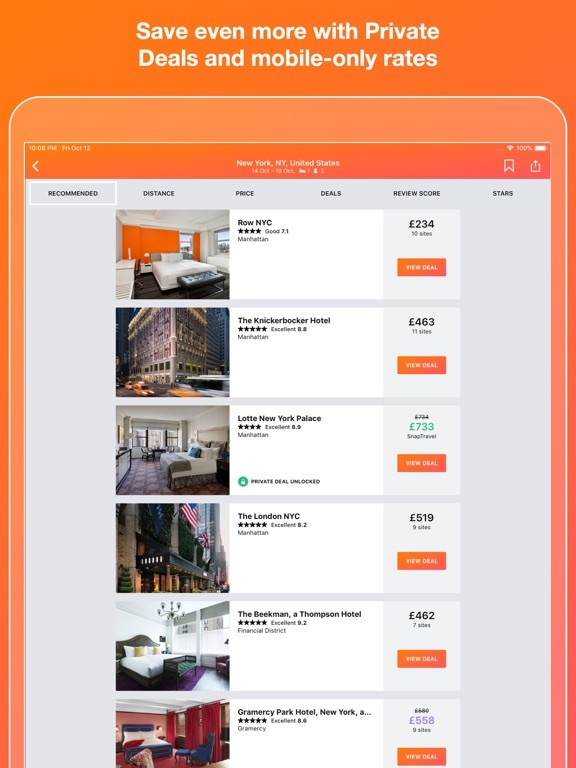 Easy to manage all sorts of Bookings and create an itinerary all autonomously from your email address!!!! User friendly and easy to use!! This constantly crashes since the latest update. 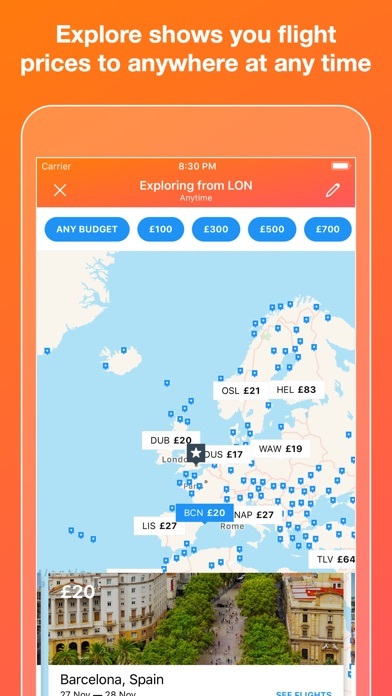 Perfect app for comparing prices while travelling, easy to use and I am always able to find a good deal. 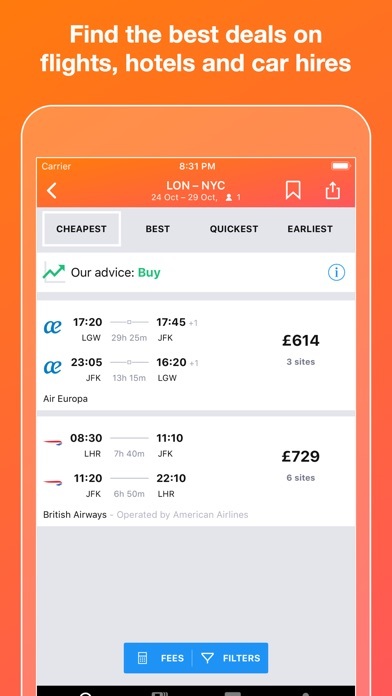 I'd generally recommend using this app just to find prices and then book directly through the airline as they'll be more equipped to handle any queries or issues with your booking. Excellent for shopping around when planning trips. Been using kayak since day 1 and it just gets better with each update, best father by far has to be explore, saves hours of searching when you have no specific destination/date and just want a cheap flight to anywhere! Resets all the filters if you change airports!! 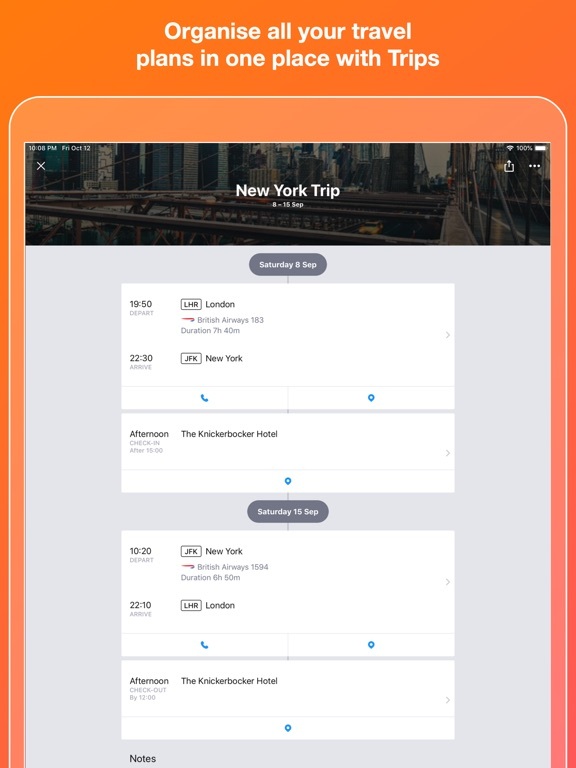 The application is easy to use, intuitive and very useful (I am a frequent traveller for my job): I particularly like the feature of being able to access to the original booking and the nice polished interface. For the time being I've tested it only on my iPad but I plan to install it on my new iPhone as well. What I personally found really outstanding is the quality of the customer support: I submitted the booking of my flight and when accessing to the trip details from both the iPad or the website I was not able to edit its details, I tried to delete the flight entry and it was impossible to remove it. I resolved sending a note to the customer service: in less than 3 hours they solved the issue of the corrupted data. The following day I discovered that the wrapped text in the 'drop off' field for the car rental was not visualised properly in my interface (I think it was due to the length of the string to be displayed): I tapped on the link to report a problem and when I accessed the application the following day I found it fixed. So far Kayak is keeping the promise of listening to their customers and improve their product. I recommended to friends and colleagues!